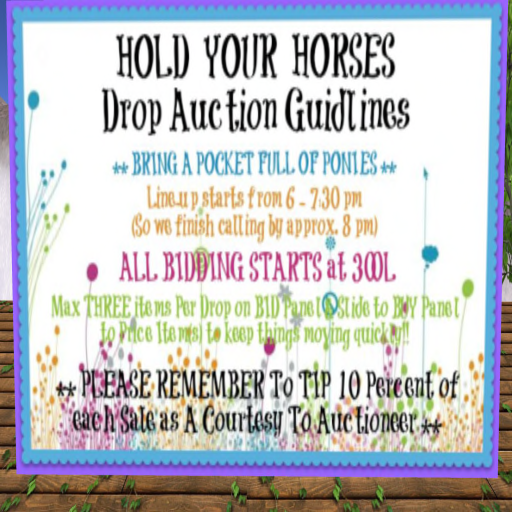 This week I went to the Nest Egg Market to a Hold Your Horses Drop Auction!If you have not been to a drop auction, you have really missed out on a fun experience!!! There are no podiums at these auctions. If you are wanting to put a breedable up for auction you stand in a line and keep the breedable in your inventory until it is your turn.! These auctions are fast passed and they keep you wondering what is coming up next! I went to the 6:00 pm Hold your Horses Drop at the Nest Egg Market! Reygan Lander and Ace Ryder were the Auctioneers for this Auction! They keep the pace moving and it was loads of fun. Reygans schedule for the Nest Egg is below! I’ll be your Friendly Tour Guide and Auctioneer!! TUES & THURS –> HOLD YOUR HORSES DROP!! SAT K9 Auction 1 PM @ MYPETS – DOGS ONLY!! Nest Egg … 1L panels!! Great FUN!! Here are some pictures from the Auction! and was purchased and still owned by owned by Josaphine Cooperstone in 2009. The Nest Egg has lots of stalls to sell your breedables, and is a high traffic market! See you at the Auctions!!! !